Pamela Donohoo has thrilled Moisture Festival audiences in years past. An exquisite aerialist, dancer, acrobat and choreographer she demonstrated her skill and charm at Hale’s Palladium in 2015, helping us to see why her work is so respected in the field of aerial arts. Her work had included commercials, award shows, educational series and theatrical shows include Le Reve in Las Vegas. Pamela also received a degree in Cultural and Social Anthropology from Stanford University and worked with nonprofit organizations throughout Africa, India, Latin America and the Caribbean. Her research and performance interests include: exploration of conflict and peace building, sustainable development, social justice, cultural development, and folklore. Pamela specializes in creating high caliber and socially relevant acrobatic performances. Her vision is to generate art that inspires people to think critically and contribute positively to their world. Then in 2017 Pamela returned, this time with a partner and we saw another aspect of her talent as she and her friend Mei Wang performed a unique performance on an aerial hoop. Now Pamela brings us another partner, Not a new one, Pamela and the exciting performer Enrique Escajeda worked together in the past. 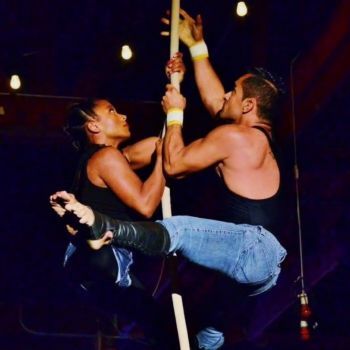 Born in Southern California, Enrique attended the Hollywood Aerial Arts where he found a new performing outlet in the arts of aerial silk and aerial rope. He spent years learning this new passion and meeting remarkable and talented people like Ruby Karen, founder and director of Orange County Aerial Arts, who took Enrique under her wing and taught him the fundamentals of aerial partnering and aerial choreography and he went on to be one of the original members of Orange County Aerial Arts/Circo Etereo. After moving on to Cal State Long Beach he studied with physical theater instructor Oralando Pabotoy who taught him to look for content and reason to the movements in the air. We are delighted to bring this interesting couple to audiences this year. Aerial rope presented by true artists.